It’s so easy to create wedding cake flowers to sit on the top tier of your wedding cake, all you need is a few insider tips of how to go about it. Create your own by following this easy step-by-step tutorial. A selection of flowers to fit with your color theme. 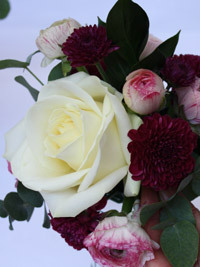 I’m using 1 rose, 1 stem of deep pink chrysanthemum and 5 pink ranunculus flowers. A small amount of coordinating foliage. I’m using 1 stem of eucalyptus and 2 stems of hard ruscus. 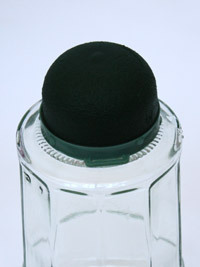 Take your mini deco and gently drop into a bowl of fresh cold water until it sinks under water. Cut your focal flower (in my case the rose) so that it has a stem about an inch long and push it into the front of the oasis bump. 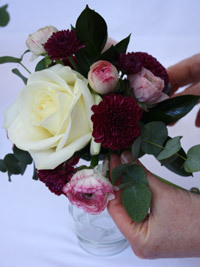 Then cut your second flowers (in my case I’m using the deep pink chrysanthemums) so that they also have short stems and place them randomly around your central flower. 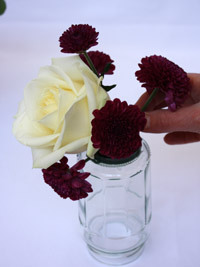 Add your third type of flowers in-between the other flowers. I’ve placed 5 pink ranunculus in-between the chrysanthemums. Then finally take short pieces of your foliage and fill in the gaps mixing the foliage so that you can’t see any of the foam oasis. 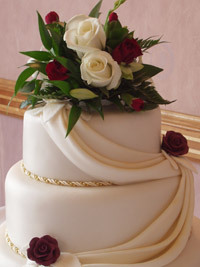 Then simply dry off the plastic base and it’s ready to place onto the top of your wedding cake. 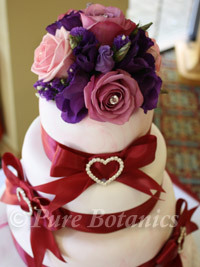 In the photo here you can see wedding cake flowers that I created for a recent bride using this technique.